Discussion in 'Apple Watch' started by abluehaze, Apr 9, 2015. Really debating on whether or not to order the space gray aluminum sport with black band or the silver aluminum sport with white band. With either one I would use a white band (until a band comes along that I like better). Just wondering how both of those watch casings would look with a white band. Anyone know of any pictures anywhere with that combo? That's stainless, not aluminum. It's shiny and the crown has the black piece in it. In fact, the Space Gray + dark SS band looks pretty __sweet__. Was anyone brave enough to try this combo ? Has anyone actually been able to pair these in store for pictures ? This is my favourite combo. If I end up getting the watch I'll be saving my pennies for the strap. This is the combo I ordered. The watch is coming the 24th but the strap claims the 4/29 - 5/12. The more I see pictures of the Milanese Loop the more I want it. I'm sure by the time my watch gets here I'll be picking up a Milanese Loop band. Hopefully it looks nice with the Space Grey Sport. You can't put any bands on the sport model besides the rubber ones. 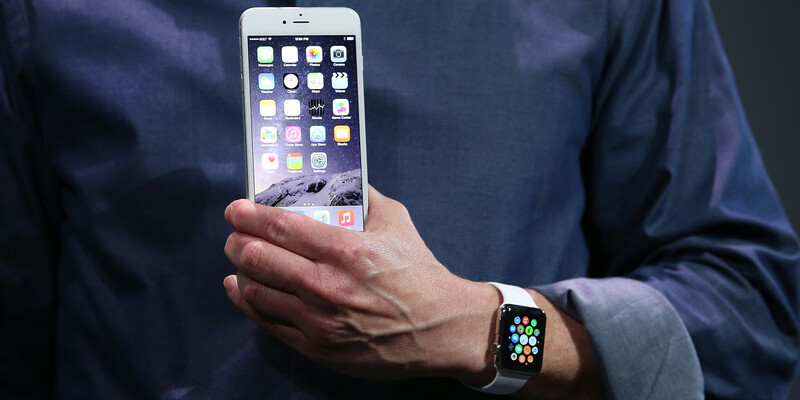 For the milinase you need the Apple Watch it Edition models. I thought I remembered them saying that during the keynote. I hope you're right, I love the combo. Just look at the picture. That band is not on the Edition watch. The picture is not from the Apple website.It will work though. All 42mm bands will fit the 42mm Sport. The clashing of the stainless steel with the aluminum is not appealing to me. If for some reason it does not fit I bet the aftermarket will take care of it. I'm guessing there will be a lot of choices soon. The main thing to keep in mind at this point is what you want the body to be made of. Bands will be easy to get later. No, all the bands are interchangeable. You just can't order the Sport with anything other than the "flubber" band. Got the 42mm Sport space grey and wouldn't mind a black leather bracelet, not from apple though. Agreed. Just like iPhone cases we should see a whole lotta bands soon. The only one I'm tempted to get from Apple (in addition to the "flubber" one) is the Milanese Loop. It looks amazing in the Instagram pics I've been looking at. The off colour doesn't look too bad. They wouldn't allow this in my store. I preordered both space grey and SS and I'm having a hard time deciding which one I'll keep. Sorry, but that looks terrible. The silver aluminum would be better despite the slight mismatch. That shot is a side view but from the top it is not nearly as bad. 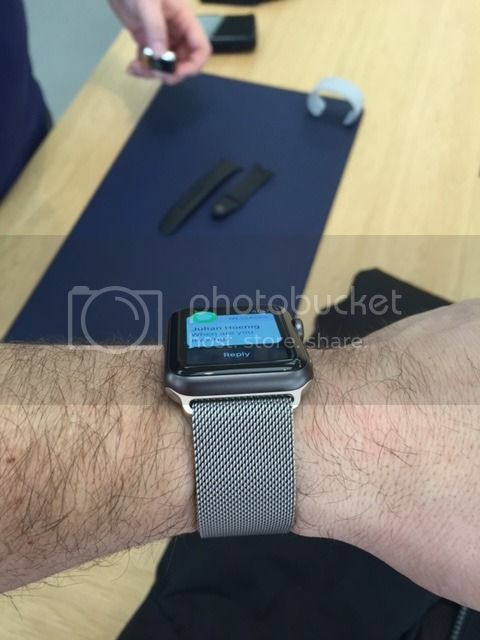 I think the problem with any other band other than the Sport Band or Leather Loop with the Sport line is that the part that connects to the Apple Watch is made of stainless steel, so it's supposed to blend with the look of the stainless steel watch. Otherwise, it's looks odd having the stainless steel next to the aluminum. I ordered a black sport with a blue leather loop after seeing this picture online.